This is not about a typical Korean skincare routine. I use a mixture of mainstream and Korean brands. Nor is it a strict 10-step skincare routine. You will find suggestions with just four products. Or even 12 steps. This regimen is only at night. I have a life. My morning routine is a condensed 4-5 step version and includes SPF. That is for another post. Do not wake up tomorrow and decide to pile on 10 products at one go. Step by step. Introduce one product into your routine at a time. Build up to it gradually. I began with no/three steps. There is no panacea out there. Some things work for some people. So include whatever suits you in your *-step routine. Your mileage may will vary. Read that again. And again. Customise the routine according to your skin type. Skip/combine/split up/add steps. 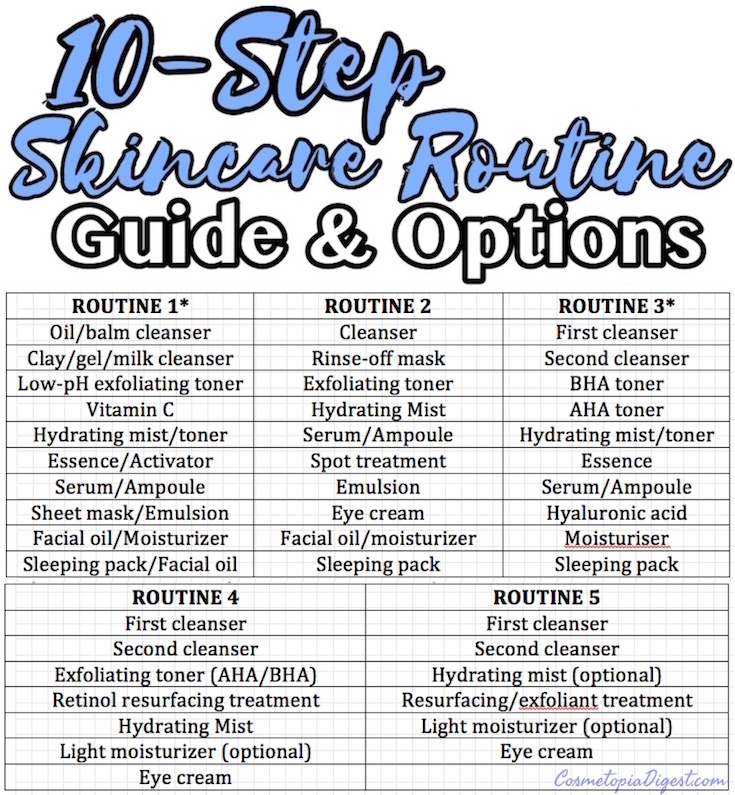 You can use spot treatment, hyaluronic acid, a rinse-off mask, a sleeping pack, and a sheet mask on the same day you use Vitamin C. You can add every step you can think of and do a 20-step routine. Entirely up to your skin. My skin type is acne-prone, and very oily (the kind where countries think of replacing their oil export deals with my face). An FAQ post will be posted tomorrow. Detailed posts on each step are also in the works. 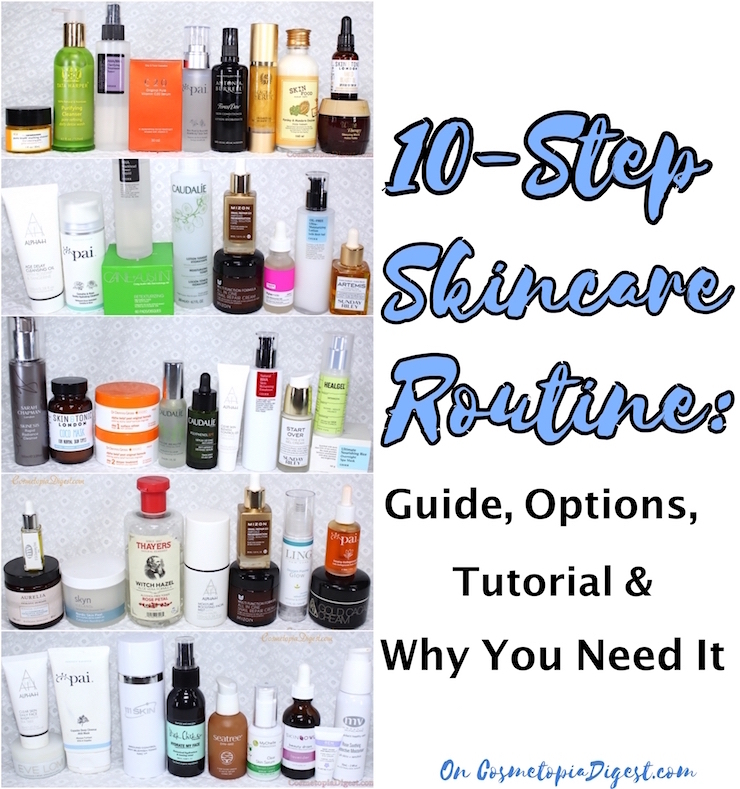 Scroll down for the Ultimate 10-Step Skincare Routine Guide and Tutorial. WHY go through a 10-step skincare routine? 10 reasons. It can incorporate everything your skin needs, from blemish treatment to hydration, anti-ageing, radiance... you name it. It cleans, exfoliates, cures, treats, prevents, heals, nourishes, hydrates and protects. Nothing left out. There is NO one miracle product that does everything, despite what beauty brands may claim. You need separate products for different things. Because your skin deserves it. It makes the skin look - and feel - so much better. There was a time when I thought my skin could look no better. Was I ever wrong! This is your ultimate pampering, nourishing facial; your daily me-time. You can go without spa facials. I have not gone near a spa for a facial in ages. This is your ultimate anti-ageing routine. IF a non-invasive, topical-only regimen can give results, this can. It does not take as long as you think. More on the time required in the FAQs tomorrow. Some general skincare routine suggestions for various skin needs. Pin/share/ignore. *Eye cream needs to be incorporated as a separate step in Routines 1 and 3. NB: Routine 4 will be explained at the end of this post. NOTE: The first step depends on whether you have worn makeup or SPF on a given day. If yes, begin at #1. If not, begin at #2. WHY? To dissolve all makeup gently, even waterproof mascara. I prefer this to the harsh two-phase makeup removers, which can contain ingredients that breakout or irritate some skins. Apply the cleanser on dry skin, massage gently for a bit. Emulsify with water. If my makeup is heavy, I use micellar water beforehand - if you have used Bioderma, wait for the face to dry a bit before cleansing. This is where I bring in the flannel cloth. Click here to see a list of the best face flannel/wash cloths. OPTIONS: Plain coconut oil. Whatever works for you. Also, I use micellar water before this step. WHY? Double-cleansing has already been written about at length. It helps fully wipe out makeup, sunscreen, sweat, grime, filth, the makeup remover itself, war, mosquitoes and promotes better absorption of your skincare. More on categories of cleansers and their differences another time. On damp skin from the previous step. After rinsing the second cleanser off, pat your face dry with the flannel. As a rule, I avoid foaming cleansers and stick to non-foaming clay, gel, or milk or cream cleansers. These second cleansers are also on rota as my morning cleansers. The clay cleansers I am talking about here are creamy and super-gentle, and not some kind of harsh, drying, gritty wreck. You can "layer" your cleanser - mix gel and clay; mix oil and clay... I like mixing liquid-gel and clay cleansers, especially Alpha-H Clear Skin Daily Face Wash Gel and REN Clearcalm Clay Cleanser. Avoid exfoliating or resurfacing cleansers if you are going to use an exfoliating or resurfacing treatment further in your routine. WHY? Because physical exfoliation - harsh scrubs - can damage the skin. Exfoliating acids do the job gently and increase cell turnover. Alpha-Hydroxy Acid (AHA) imparts a glow; Beta- (BHA) takes care of blemishes. These are available in both liquid and pre-soaked pad forms. I usually use a tingly acid pad. If I use Vitamin C, I specifically use a low-pH toner such as CosRx AHA/BHA Clarifying Toner. Avoid acid toners if using a resurfacing treatment (shown further below). If liquid, apply using a cotton pad. If pre-soaked, pat all over face, ears, neck, backs of the ears (yes!) and if the pad is still moist, do your elbows. No point in wasting product. Moisturise elbows afterwards. Before applying the next product, give the face a bit of time for the toner to do its magic. Some people prefer waiting until the tingly feeling (if any) goes away. I apply my toner and wait for as long as it takes to brush out my long hair. You can use BHA and AHA on the same day. Or a product which contains both. You can also use a rinse-off AHA mask here, such as Pai Copaiba Deep Cleanse AHA Mask (see photo above), or REN Glycolactic Radiance Renewal Mask. Go here for my list of exfoliating/toning pads. Over time, it helps prevent fine lines and encourages collagen production. If you have dark spots, photo damage, or post-inflammatory hyperpigmentation *cough yes cough*, Vitamin C will help fade the marks sooner. HOW? Certain formulations of Vit C (L-Ascorbic Acid) work with a low pH. I use Vit C right after my toner. Wait for 20-30 minutes before applying anything over Vitamin C, to give it time, before you alter the pH again. I go have my dinner after this stage. Remember to store Vitamin C concentrates away from light and heat. OPTION: Use a general serum with a lower concentration of Vitamin C at the Serum/Ampoule stage. Here is how my routine with Vitamin C looks. This is my current regimen - only, I alternate with Mizon's Snail Repair products as the essence and serum. To soothe the skin after all those acids. To sandwich as much moisture as poss. between layers. To rehydrate and refresh during the day. No, hydration will not "make" the skin oily. HOW? Spritz all over if using a mist. Apply on cotton pad and pat on face if regular bottle. I prefer mists. They save a fortune in cotton pads and feel so much better on the face. Wait till face is touch-dry before you proceed to the next step. OPTIONS: This step makes my face feel so good that I don't have alternatives. You can see I'm obsessed with this step. And that's not counting the ones on my desk, in the car and in my handbags. WHY? An essence is a concentration thicker than a toner but thinner than a serum, and helps better absorption of subsequent products. If you scoff at that, think of it as an extra layer of moisture; you cannot have too much hydration for the skin. It is a lighter pre-serum treatment, to be followed with the big guns. I use an essence that contains whatever is not in my serum, so I get the benefit of a variety of ingredients. HOW? Pat it in. It absorbs better that way. Wait till more or less absorbed (not ultra-dry, that won't happen) before proceeding. WHY? Delivers key concentrated repairing/protecting/nourishing/treatment ingredients to the skin. What Koreans call an "ampoule" is a saturated super-serum. Ingredient concentrations in Korean skincare can be many times that you see in mainstream/Western brands. For instance, OST's C21 has 21% Vitamin C, whereas most mainstream brands go for lower than 15%. HOW? I like to press the product in gently with my fingers. Wait till it sinks in a bit. OPTION: Choose from clarifying serums, hydrating serums, radiance serums (can be exfoliating or Vitamin C-based), retinol serums (different from retinol resurfacing treatment; more on this in a minute), repairing serums, or those with a mixture of ingredients. WHY? Let's focus on emulsion. You probably use eye creams anyway, and I'll address them in a separate post. Ditto spot treatment. Emulsions are very light treatment lotions that also contain humectants that draw in moisture - from the air or layers right above them. The treatment aspect and the runnier, lighter texture make these different from regular moisturisers. I like emulsions that fight blemishes. Emulsions are non-occlusive, so whatever you apply above will sink in as well. You don't have to use an emulsion, a moisturising lotion and a sleeping pack at one go. Go ahead if that is what your skin likes, though. I use emulsions containing salicylic acid, tea tree gel, centella asiatica, seabuckthorn, or other blemish-fighting ingredients here. If my skin feels flaky and there is no acne, I use hyaluronic acid instead. Give it a few minutes to sink in. Brush your teeth in the meantime. You can use a hyaluronic acid lotion here. If my skin is congested, I use both spot treatment and a light salicylic acid or centella asiatica treatment emulsion. If you cannot find an "emulsion", look for the lightest, runniest moisturising lotion that contains no occlusive ingredients. Or just spritz your face mist once more. This step can also be eye cream or spot treatment, or a sheet mask. WHY? Because moisturiser. 'Nuff said. There are three categories of moisturisers - humectants, emollients and occlusives. I need a whole separate post on this. For getting the job done here and now, let's just divide them into "lightweight moisturisers" and "occlusive or heavy moisturisers". Facial oil has been a revelation for me. Last year, my dermatologist convinced me to add a light oil to my routine, despite my copious oil production. It has balanced my skin beautifully. HOW? I take a bit of facial oil on my fingertips, and rub all my fingers together gently. I then press them on the face to apply. If you have specific dry areas that need care, press the facial oil into those areas. Use a thick moisturising cream and stop your routine. That's it. Click here for my list of the best facial oils. Step 10: Sleeping pack OR occlusive facial oil such as Sunday Riley Artemis. WHY? An all-occlusive final step that locks in all the goodness you've layered earlier, and provides a boost of nourishment as you sleep. HOW? See routine photos above. Follow lightweight moisturising lotion with occlusive facial oil. Follow light facial oil with sleeping pack. Again, the Koreans make 'em best. WHY? This is an intensive chemical exfoliating step that will stimulate cell turnover, help expunge acne marks and pigmentation, and give you a very thorough glow when you wake up. I use this once a week. Detailed post later. HOW? IF you are using a resurfacing treatment, skip step 3 (exfoliating toner). The exception is the Dr Brandt Retinol Resurfacing Serum, which can go on after acid (as mentioned in Routine 4). Apply a hydrating mist, or even a proper moisturiser for less intensity, but some hydration. Leave the resurfacer on by itself and not moisturise, for an intensive treatment. I prefer doing this because I'm lazy. Whew. Still awake? FAQs about the 10-step skincare routine will be published tomorrow. Till then, enjoy other beauty posts in the Monday makeup madness linkup here.